When a reporter introduced himself, [Sheldon] Adelson responded: "Why do you guys keep writing negative things about me?" Asked why he had come to Israel, the press-shy Adelson would only say, "I came to get a shwarma sandwich, what do you mean?" Religious figures and warned of the danger of national Israeli aggression against Al Aqsa Mosque and the Gate, and impose a new reality in the light of the world's preoccupation with the Arab spring. This came in a press conference held by the Al-Aqsa Foundation for the stop and Heritage today to detect the most recent Israeli attacks over the Al Aqsa Mosque and the Mughrabi Gate calling it "a fierce attack on the Al-Aqsa Mosque." ..."the occupation continues its crime in order to open the door...to reach through it to the chapel bright one of the buildings of the Al Aqsa Mosque towards the Judaization of this place, also aims to open the door leading to a network of tunnels under the Aqsa Mosque from the area of ​​the Mughrabi Gate, the conversion part of the vacuum to the reality of the Mughrabi Gate in the way of what he calls fraud 'Wailing Wall for the Jews.' "
... the Mughrabi Gate and Al-Aqsa mosque are all Islamic waqf, and attacks on these areas is an attack on the Islamic Waqf, the right of the rights of Muslims not only in Palestine but in the world...bullldozers demolish the Mughrabi Gate...an integral part of the Wailing Wall, the Wailing Wall an integral part of the western wall, western wall and an integral part of the Al Aqsa Mosque. " ..."The occupation wants to resolve the battle for Jerusalem through the creation of new facts, and certainly the Al-Aqsa Mosque is the spearhead." "The Al-Aqsa Mosque is witnessing this period, a plan to impose a systematic...break into a large-scale, and especially that the Israeli forces stormed the squares in an orderly fashion...We regret that the National Authority remiss about Jerusalem, because they do not put Jerusalem on the top priorities, and asked her to bear the responsibility of national and political and financial support the steadfastness of the residents of Jerusalem, and the official announcement that the Oslo agreement failed ...! I do not know why they are sticking to this agreement ...? Check this out from the other side. Yes, Ono. No, that's not misspelled. It is, however, a play on the Hebrew word for sexual potency. Bear with me as I translate and explain. First of all, I think these are scenes taken from Gideon Levy's appearance in a reality program called "Linked Up" ( or Attached, in Hebrew: M'chubarim ). Since it's in Hebrew, the panels proceed from right-to-left remember. Panel One: Gideon on a couch, it seems, with a women alongside. She's looking a bit peeved. Panel Two: She says, "It's okay, Gideon. Every man has it happen to him at least once in a lifetime." Panel Three: Gideon says, "You know how it is, I am under much pressure at work. The heat. The occupation..."
Panel Four: She's imagining another participant who happens to be Hanoch Daumb, a resident of Elazar in Gush Etzion. Panel Five: Channel 10 newscaster announces "Today in Hebron a Palestinian child was shot by IDF forces." Panel Six: "After an hour and a half...." with Gideon grinning. Has Gideon Levy lost his charm? Did you catch the error? That would be fair journalism. Not every statement is truthful, even if it need be published. And what one person considers offensive may not be. P.S. Read this. And this. This. And Seth Mandel. And Max Boot. Labels: Mitt Romney, NYTimes, Pals. 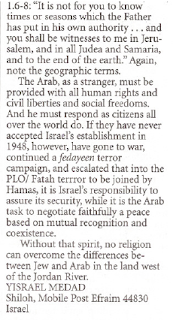 ...In his column on Monday, Yedioth Ahronoth's senior political analyst, Nahum Barnea, used the various code words to fire-up his crowd...reiterat[ing] the same old line of attack that has been a mainstay of the Left since the days of Joseph Stalin — both at home and abroad: Take a swipe at the person and use malicious language against him rather than fight over ideology. How does Barnea and his gang view the world? Ever since the Israeli left realized that it had failed to win over the majority of Israelis, it has moved away from the people....Despite the painful blows history has dealt the Left, it has remained a religious cult whose members do not let the facts confuse them. Israel lacks a real dialogue between conservatives and liberals, between the Left and the Right; just as it does not have real dialogue between the religious and the secular. Whereas conservative, religious or right-wing Israelis evaluate the Left's arguments according to the changing reality, the Left has a adopted a blind and condescending approach that idealizes ignorance under the guise of intellectualism. 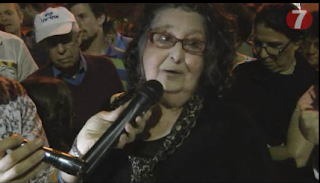 A senior U.S. reporter was asked two days ago whether it was indeed true that the "fund-raising event has caused a stir in the U.S. media," as Barnea put it. The reporter was baffled by the question. Indeed the left-wing media outlets in the U.S. are in the tank for Obama, just like most of the Israeli media is anti-Netanyahu. This is the main thing we have to understand — political journalism has come at the expense of true journalism. Barnea even went so far as to use Israel's national poet, Chaim Nachman Bialik, to make his point. Alluding to one of Bialik's famous poems, "A Bird's Nest", Barnea said "two eggs are now in Sheldon's nest, among the trees, and each has a precious chick inside — Mitt and Bibi [referring to Romney and Netanyahu]." "Both are fed from the same beak; they both view the same checkbook as their hope for political survival; this is a first in the relations between the two countries." So there you have the hollow left-wing condescending rhetoric in a nutshell. I have heard the same line of attack from Barnea impersonators in the media who say Netanyahu does not have his own opinions or that he lacks a coherent world view; or that he has no ideals or goals apart from pleasing fake patrons. The same applies to Mitt Romney, they say. The blind supporters of Barnea, an Israel Prize for Journalism laureate, should listen closely to his bad-mouthing: The person who might become the next leader of the free world cannot formulate his own opinions and is a puppet of a Jewish tycoon. So there we have it: a revised, current and contemporary edition of the Protocols of the Elders of Zion. The sensitive issue of Israeli settlement construction in the Palestinian West Bank is something that should be "discussed in private," Mitt Romney said in an interview with CNN Monday. "I believe that the issue of settlements is something which should be discussed in private by the American president and our allies," Romney told Wolf Blitzer on "The Situation Room." "When we show diplomatic distance between ourselves and our ally, I think we encourage people who oppose that relationship to seek other means to achieve their ends." Religious freedom is not just about religion. It’s not just about the right of Roman Catholics to organize a mass, or Muslims to hold a religious funeral, or Baha’is to meet in each others’ homes for prayer, or Jews to celebrate High Holy Days together – as important as those rituals are. Religious freedom is also about the right of people to think what they want, say what they think, and come together in fellowship without the state looking over their shoulder. That’s why the free exercise of religion is the first freedom enshrined in our First Amendment, along with the freedoms to speak and associate. Because where religious freedom exists, so do the others. It’s also why the Universal Declaration of Human Rights protects freedom of thought, conscience, and religion – all three together – because they all speak to the same capacity within each and every human being to follow our conscience, to make moral choices for ourselves, our families, our communities. So why can't I enter the Temple Mount without overt restriction? Cannot pray anywhere therein, as unobtrusively as possible? Cannot read a Psalter or from Lamentations? Cannot dig there to excavate archaeological finds from my people's history at the site from two or more millenia ago? Why is my religion secondary? The 1967 Protection of Holy Sites Law safeguards the holy sites of all religious groups, including in Jerusalem. All holy sites enjoy certain protections under the penal law, which makes it a criminal offense to damage any holy site, while historic sites are protected by the antiquities law...A government policy since 1967, repeatedly upheld by the Supreme Court and routinely enforced by the police citing security concerns, denies all non-Muslims opportunities to worship at the Temple Mount/Haram al-Sharif. While the government ensured limited access to the Temple Mount/Haram al-Sharif to everyone regardless of religious beliefs, only Muslims are allowed to pray at the site, although their access has been occasionally restricted due to security concerns. Police regulated traffic in and out of the compound and removed non-Muslim visitors if they appeared to be praying. Since 2000 the Jordanian Waqf that manages the site has restricted non-Muslims from entering the Dome of the Rock shrine and Al-Aqsa Mosque. Non-Muslim religious symbols are not allowed to be worn on the Temple Mount/Haram al-Sharif. Government authorities prohibit mixed-gender prayer services at Jewish religious sites maintained by the Chief Rabbinate in deference to the belief of most Orthodox Jews that such services violate the precepts of Judaism. At the Western Wall, men and women must use separate areas to visit and pray. According to a policy repeatedly upheld by the Supreme Court, women are not allowed to conduct prayers at the Western Wall while wearing prayer shawls and are not permitted to read from Torah scrolls because this form of prayer by women violates Orthodox interpretations of Jewish law. There is a separate prayer area along the Western Wall, south of the Mughrabi Gate where women may read the Torah and pray wearing prayer shawls. The signs posted around the Western Wall plaza requesting gender segregation throughout the plaza, rather than just at the prayer areas, were removed in 2010. Official “modesty patrols” occasionally attempted to enforce gender separation and guarded the path designated for “men only” that was installed in 2009 opposite the Western Wall. 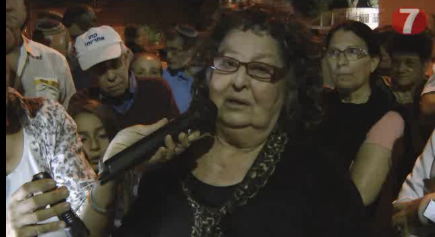 According to the government-appointed Rabbi of the Western Wall, the path was created for those who asked to be able to get to the Western Wall plaza without having to walk through a mixed-gender area. Now meanwhile, Egypt is grappling with these challenges as it navigates its unprecedented democratic transition. And during my recent visit, I met with members of the new government, including President Morsi, and representatives from Egypt’s Christian communities. Religious freedom was very present behind closed doors and out in the streets. President Morsi has said clearly and repeatedly, in public and private, that he intends to be the president of all the Egyptian people. He has pledged to appoint an inclusive government and put women and Christians in high leadership positions. The Egyptian people and the international community are looking to him to follow through on those commitments. But I heard from Christians who want to know that they will be accorded the same rights and respect as all Egyptians in a new government led by an Islamist party. They wonder, understandably, will a government looking explicitly to greater reliance on Islamic principles stand up for non-Muslims and Muslims equally? Since this is the first time that Egypt has ever been in this situation, it’s a fair question. Egyptians are building a brand new democracy. What it will look like, how it will work, how it will handle religious pluralism – Egyptians will be writing the answers to those and many other questions for years to come. As I told the Christians with whom I met, the United States does not take the side of one political party over another. What we do is stand firmly on the side of principles. Yes, we do support democracy – real democracy, where every citizen has the right to live, work, and worship how they choose, whether they be Muslim or Christian or from any other background; where no group or faction can impose their authority or their ideology or their religion on anyone else; where there is healthy competition, and what we call checks and balances, so no one institution or leader gets too powerful and the rights of all citizens are respected and protected. The Egyptian people will look to their elected leaders to protect the rights of all citizens and to govern in a fair and inclusive manner, and so will we. And if voters make different choices in future elections, then they and we will expect their leaders to respond to the will of the people and give up power. We are prepared to work with the leaders that the Egyptian people choose. But our engagement with those leaders will be based on their commitment to universal human rights and universal democratic principles. Another important aspect of Egypt’s transition is whether citizens themselves respect each other’s differences. Now we saw that capacity vividly in Tahrir Square, when Christians formed a circle around Muslims in prayer, and Muslims clasped hands to protect Christians celebrating a mass. I think that spirit of unity and fellowship was a very moving part of how Egyptians and all the rest of us responded to what happened in those days in that square. And if, in the years ahead, if Egyptians continue to protect that precious recognition of what every single Egyptian can contribute to the future of their country, where people of different faiths will be standing together in fellowship, then they can bring hope and healing to many communities in Egypt who need that message. 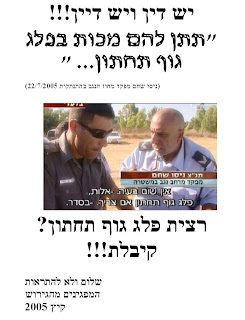 Haaretz To Be Sued; Whose Attacking the Media Now? Anat Kam intends to file suit against the newspaper "Haaretz" and Uri Blau, due to it exposing her as the journalist's source announced attorney Ilan Bombach, during an appeal filed up to the Supreme Court against the sentence of four and a half years imposed on her for handing over secret IDF documents to Blau. However, the claim will be filed only after the appeal decision, which depends on the sentencing Blau at the Tel Aviv Magistrate's Court, after reaching a plea bargain with the prosecution for possession of confidential information. Look who is now calling the kettle black - Kam, the heroine of the anti-occupationists, is suing the...press. I have been going over newspapers that somehow just piled up without regular reading. It happens. In Jerusalem Magistrate's Court, the state argued that he was a member of a terrorist organization and that he strives for the destruction of Israel. Pshenichnikov rejects Zionism and says his views are close to those of the Popular Front for the Liberation of Palestine. He told Israeli officials: "I have concluded that Israel is the representative of Western power interests in the Middle East, and that Zionism made cynical use of the Jewish faith … I hate Zionism". 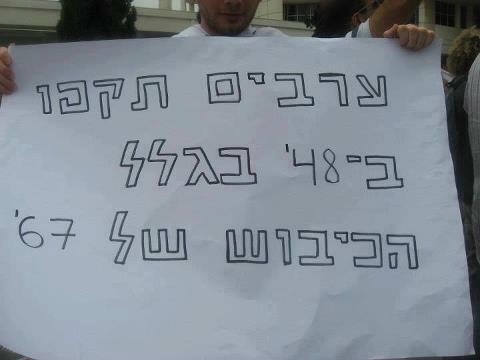 Pshenichnikov also encouraged others to join him in opposing Israel: "I want to be part of the Palestinian resistance. I call for other Israelis who support the existence of a state of Palestine to do the same, to come live in the West Bank or Gaza as Palestinians." Will he eventually die a "martyr's" death? I know that basically the campaign to get an official Olympic Committee "Moment of Silence" for the Munich Olympic victims of terror, who all happened to be Israelis - for some reason - has basically failed. Not that a lot of important publicity was generated and even a vigil was maintained in London but nevertheless, nothing official. Except for the British victims of 2005! How I “love” Jews who hate each other so much. “AJC was surprised to learn last night that the International Olympic Committee (IOC) indeed chose to hold a moment of remembrance for terror victims — just not one dedicated to the memory of the 11 Israeli Olympians murdered by Palestinian terrorists at the Munich Olympics 40 years ago. After rejecting repeated requests from the victims’ families and world leaders, including President Obama and the Australian, Canadian, German and Italian parliaments, for a minute of silence at the opening ceremony in London, there was a commemoration of the victims of the 2005 terror attacks in London. …IOC President Jacque Rogge repeatedly turned down the requests for honoring the fallen Israelis, saying that such a moment of silence would not be appropriate and, misleadingly, had no precedent. 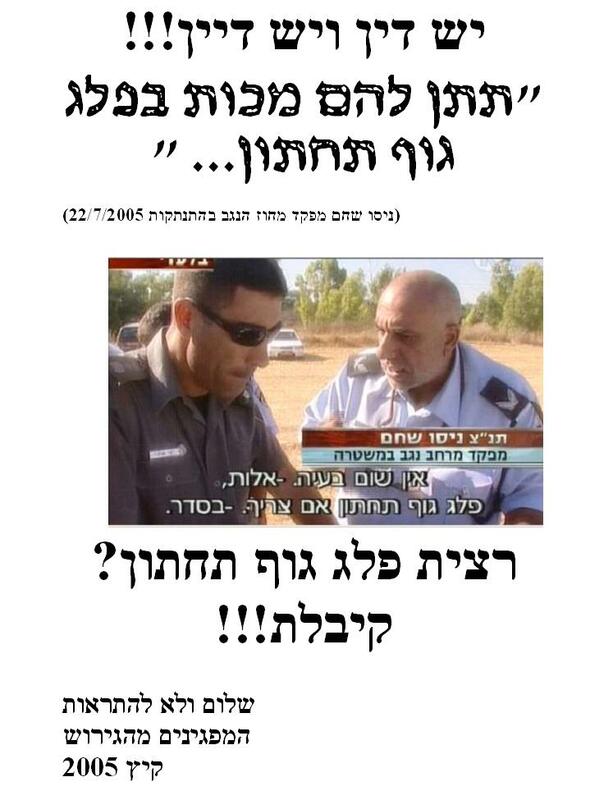 Seven years ago, Police Commander Nisso Shaham was caught on video during the disengagement instructing a border guard unit who were besieging anti-evacuation marchers at the Kfar Maimon moshav. It was shown on Channel Two news and caused his removal from duties during the Disengagement. "No problem whatsoever – batons, lower body parts if necessary. (Acknowledgement: "OK.")"
Hauntingly, someone has turned that now into a boomerang poster after Shaham was suspended, suspected of sexual harassment of policewomen, at least 5 if not more although he claims it was with full consent. There's a judge and judgment. You wanted lower body parts? You got 'em!!! North of Kiryat Arba at Bet Anun Junction Arabs attacked Israeli vehicles with rocks causing damage. Israeli tourist bus attacked by Arabs with rocks when approaching Kiryat Arba causing damage to the windshields. 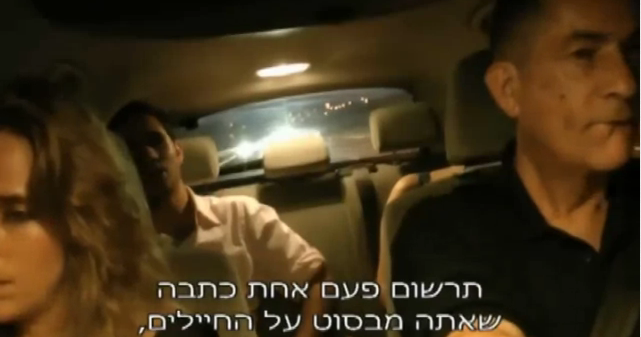 Arabs attack Israeli vehicle from moving car with rocks between Bet Hagai and Kiryat Arba. Vehicle with 2 Arabs inside bashed into the IDF checkpost at El Azim near Ma'aleh Adumim in an attempt to run over a ranking officer of the Israeli Border Police and the greater Jerusalem Region. The officer opened fire on the terrorists attacking him and mortally injured the driver who died later on, another terrorists was injured and a border policeman was injured from the shrapnel. The injured were evacuated to Ein Karem Hospital in Jerusalem. Jewish resident of Hebron attacked by group of Arabs when he went to bathe in the Spring near Tel Romeida. Arabs attack IDF patrol and Israeli vehicles with rocks on the Gush Etzion-Hebron Highway near Bet Umar and Halhul. Jewish community of Hebron: Arabs attack IDF soldier and Jewish civilians with blocks. I try to stay away from in-camp arguments in public. Unless there are factual errors, rather than differences of opinion, I have found that disputes really do no good. However, since the article in question I am bothered about was posted online, and by Ynet, thus assuring wide distribution, and since I have already been asked about it, and I have a feeling it will come back to haunt us,I cannot but relate to it and will do so compactly. 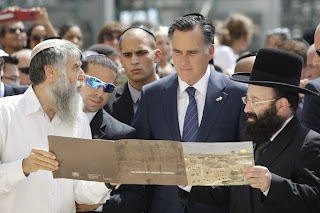 The article expresses a negative view of Mitt Romney's visit to Israel. No, not from a J Street or Open Zion standpoint, nor even from the Democratic National Committee but from an official spokesperson from the Samaria Regional Council, of all people. Romney's repeating of the expected mantra about America standing with Israel if Israel attacks Iran is not very convincing, and is pretty close to meaningless. unhappy today with Mitt Romney's visit to Israel: not because of the intention, which I believe is good, but because of the choice of the visit's date - which is terrible. Think of this distinguished visitor coming to the Kotel for a photo op, all shining clean and smiling – while walking by Jews sitting on the ground in mourning for our Temple that once towered over that very spot. It is about as close as an insult to our dignity as could be conceived. Well, to be kind, I could say that it was Tisha B'Av and the fasting affected his writing. Or that since Mitt is a Mormon, maybe this was a blow for Christians. Or perhaps he wasn't invited to any of the events (I don't know that and I myself was excluded although if I had stayed at the Western Wall Plaza instead of going straight to the Rav Goren Minyan maybe I would have seen him). It's not that there isn't a logic in the piece. Nevertheless, it doesn't make sense. I saw hundreds of Jews doing the exact same thing, taking pictures, standing next to the Kotel and all, there yesterday. Local residents and from afar. And dressed quite less modestly that the Romneys. Not only that, but the words Mitt spoke before and after the visit to the Western Wall were superb. The photos were wonderful (see how I used one). And after all, the Wall is but the external portion of what is truly sacred - the Temple Mount. - although the timing at first seemed problematic, he turned it around and made it one of the utmost support for Jerusalem exactly on the most proper day - Tisha B'Av and I am given to understand that family members fasted for a period of time in empathy and the trip to City of David was powerful. 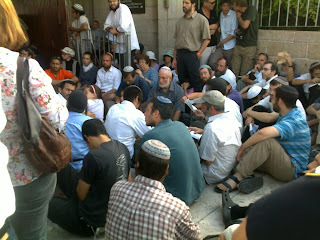 - the meetings with Mofaz and Yechimovitch were cancelled which means that the Kotel is more important. - Abbas was not on his visitors' list. - his statement on Jerusalem as Israel's capital was unequivical. "we never miss an opportunity to shoot ourselves in the foot." It is something like coming to someone's mother's funeral and asking for cake, and then posting your picture all over the internet eating the cake, and commenting how much you love your host and promising to put in a good word for him if he has a problem with his neighbors. America is Israel's friend despite the current Administration and despite the State Department. That the Bible-believers there will fight Israel's fight. And that he is comfortable with Jewish support. That is well-worth any slight - and I think there was none - that some people think was done. ...emphasized faith—a subject he rarely addresses on the campaign trail back home. "I am overwhelmingly impressed with the hand of providence, whenever it chooses to apply itself, and also the greatness of the human spirit, and how individuals who reach for greatness and have purpose above themselves are able to build and accomplish things that could only be done by a species created in the image of God," Romney said. "I come to this place, therefore, with a sense of profound humility, as I look around here at great people who've accomplished a great thing, and also a sense of spiritual connection, acknowledging the hand of providence in establishing this place and making it a holy city." Not very smart. Holocaust Day is the day personalities visit Yad Vashem. "Where does Mitt Romney stand?" demanding that the presumptive Republican presidential nominee commit to a two-state solution to the Israeli-Palestinian conflict...Romney during the presidential campaign has not endorsed the two-state solution, but has said the Palestinians must show commitment to a two-state solution as a predicate for peace talks advancing. He also has noted that Israel's government seeks a two-state solution. As presidential candidate Mitt Romney prepares to travel to Israel, J Street, a pro-Israel, pro-peace advocacy group, is releasing a new video urging the presidential candidate to publicly stand with the last three Prime Ministers of Israel and decades of Republican and Democratic leaders in favor of a two-state solution. To date, Romney has been relatively circumspect when it comes to Israel, resisting the inclination of other candidates in the Republican field who have staked out positions to the right of Israel’s own government’s to burnish their “pro-Israel” credentials. While he has yet to declare whether he supports the two-state solution, Romney has been critical of President Obama’s efforts to achieve it. It has been widely speculated that a recent $100 million pledge to support Romney’s bid by right-wing billionaire Sheldon Adelson could prove a determining factor in Romney’s stance. JStreetPAC has consistently broken new ground since its establishment in 2008, becoming the largest pro-Israel PAC in its first election and in each since, as well as the first to disburse more than $1 million in a single cycle. This year, the PAC is not only on track to surpass its endorsement of 61 candidates in 2010, but to distribute more than its previous record of $1.5 million to candidates. What's with this "long-standing cornerstone" business? The US has been anti-Jerusalem since 1949 but 99% of American Jewry and almost that of non-Jews support a different "long-standing" American policy. Is J Street implying its un-American not to support J Street's radical, extremist ideological positions? Americans have a more positive (35%) than negative (23%) view of Israeli prime minister Benjamin Netanyahu, though 41% are not familiar enough with him to rate him. Views of Netanyahu are similar to what they were in Gallup's last measurement -- in May 1999, during the latter part of his first term as prime minister. The July 9-12 poll was conducted in advance of Netanyahu's scheduled meeting with Republican presidential candidate Mitt Romney this weekend in Israel as part of Romney's overseas trip. Seems Nancy Pelosi is in trouble, too. Not another justification of the Biblical narrative on behalf of the Jews? 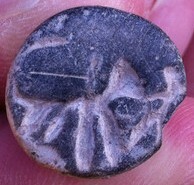 And more importantly, the level excavated in Early Iron, which fits the period of the Judges. And were these 6000 dead Jews? The campaign to boycott produce and production originating in Judea and Samaria should be contested. "Once again you will plant vineyards on the mountains of Samaria. the planters shall plant, and shall have the use thereof." then shall they dwell in their own land which I gave to My servant Jacob. and they shall worship the LORD in the holy mountain at Jerusalem. and plant vineyards, and eat the fruit thereof. shall again take root downward, and bear fruit upward. Mitt Romney, the all-but-official Republican presidential candidate, delivered a stem-winder of a speech to the Jerusalem Foundation today, packing emotional support with frank policy statements. The contrast with Obama could hardly be more dramatic. Indeed, one could go through the speech and note the many refutations of Obama. For example, the opening comment that "To step foot into Israel is to step foot into a nation that began with an ancient promise made in this land" directly contrasts with Obama's crabbed statement in Cairo about "the aspiration for a Jewish homeland [being] rooted in a tragic history." Also, in contrast to the nonsensical Obama administration stance on Jerusalem – sneaking in changes to captions that identified it as such and going through verbal gymnastics to avoid calling it that – Romney came out and plainly called Jerusalem "the capital of Israel." Many of his statements are paeans to the Jewish state and its extraordinary ties to the United States... it is the final words that most struck me: "May God bless America, and may He bless and protect the Nation of Israel." When last did a politician ask the Lord to protect another country and not his own? I guess Jerusalem is so much better a location than, well, Cairo for that matter. The "temple area" and the "temple plaza" are up above, inside the Temple Mount esplanade, the walled compound. The Western Wall Plaza is outside the Temple Mount area altogether. I hope the Muslims don't get over-excited and incite. A number of youth groups organized on Sunday afternoon a sit-in outside the Jordanian Ministry of Awqaf, calling for an official strong government position in response to the Israeli calls to storm Al-Aqsa Mosque. The protesters chanted slogans demanding the government to intervene immediately to stop the Israeli attempts to storm Al-Aqsa mosque on the anniversary of the so-called “Destruction of the Temple”. The protesters threatened to escalate the protest movement in case the Jordanian government did not shoulder its responsibility towards Al-Aqsa. Israeli settlers and soldiers have staged repeated break-ins to Al-Aqsa Mosque in Jerusalem’s Old City in recent weeks, as the anniversary of the destruction of the Second Temple looms for the city’s religious Jewish population. 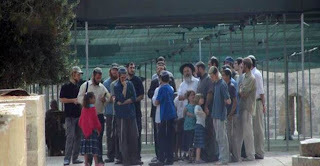 The hundreds of Jews who planned to enter the Temple Mount esplanade today, Tisha B'Av, are being hindered by a police refusal to permit them entry despite assurance this past week that the area would be open as usual. The police have announced that due to a suspicion of "provocations", they have closed the Temple Mount to Jews. An appeal was sent to the High Court of Justice. Police commander Moshe Barkat told Army Radio that the police will allow Jewish worshipers to enter the Temple Mount during Tisha Be'av on Saturday night and Sunday. He noted that the police will attempt to prevent clashes with Muslims praying on the Mount during the month of Ramadan. 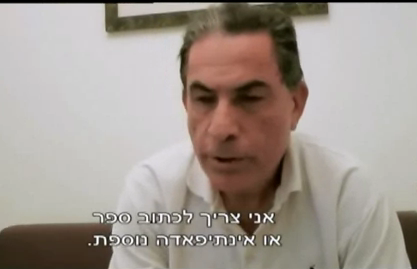 Eldad said much could be learned from the “problematic deal” signed recently regarding Givat Ha'Ulpana in Beit El. “It is that they decided there not to demolish the homes, but rather, to cut them in pieces,” he noted..."Let us learn that even more so, this applies when the time comes to build the Holy Temple, and that will be soon. We will then cut up the structure which is there now,” he proposed. Pics from Islamic news sites of the situation inside the Temple Mount today. ...Obama appears to believe that Israel needs to understand that if it doesn't move, the United States will be hard pressed to continue to give it complete support. In this respect, when it comes to Israel, Obama is more like Jimmy Carter minus the biblical interest or attachment, or like Bush 41 minus a strategy. My sense is that, if he could get away with it, the president would like to see a U.S.-Israeli relationship that is not just less exclusive, but somewhat less special as well...when it comes to Israel, Obama is more like Jimmy Carter minus the biblical interest or attachment, or like Bush 41 minus a strategy. My sense is that, if he could get away with it, the president would like to see a U.S.-Israeli relationship that is not just less exclusive, but somewhat less special as well... on the issue of a peace settlement, Obama's views are much closer to the Palestinians than to Israel... the U.S.-Israeli relationship is in for a turbulent period. There will be no transformative moment here for the two main players. 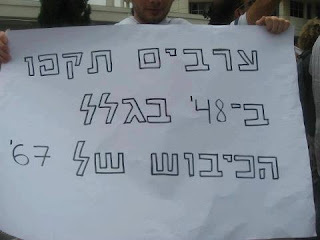 If Obama had a wish regarding Israel, it would be that anyone --Shaul Mofaz, Tzipi Livni, Ehud Olmert -- replace Bibi. And when Bibi blows out the candles on his next birthday, he'll be wishing that Mitt Romney defeats Obama in November. It's fascinating to consider that in the two most recent cases where American presidents clashed with Israeli prime ministers -- Carter and Bush 41-- both were defeated. Is Philip Weis An Idiot or Just A Propagandist? I’m no stranger to Israel and Palestine, still what shocks me about coming here is how blatant the system of unfairness is...A few impressions of the blatancy. I flew into Ben Guiron from Newark and my flight was mostly Jewish. There were no Palestinians or Arabs on the flight, as far as I could see. The sense was reinforced at Ben-Gurion. I saw no women wearing hijab, the customary form of dress in this part of the world. 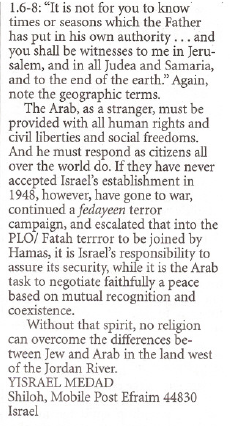 So, a lack of Arabs is --- blatant apartheid. To turn the tables: a Hamas terrorist didn't kill a Jew today? Is he not a terrorist? Hamas movement lashed out at the Israeli occupation authority (IOA) for recent escalation in violations against the Aqsa mosque in occupied Jerusalem and against worshipers. In a statement on Friday, Hamas warned the IOA against persisting in such attacks especially in the holy month of Ramadan, describing the attacks as blatant violation of heavenly religions and international norms other than a clear provocation to millions of Muslim around the world. Hamas, which was commenting on the repeated desecration of the mosque and attacks on worshipers at the hands of Jewish settlers and Israeli soldiers, appealed to all Palestinians capable of reaching the holy site to do so and to confront the IOA racist policies. The International Quds Institution (IQI) has warned of an expected escalation of incursions by Jewish settlers into Al-Aqsa Mosque with the approach of the anniversary of the “destruction of the Temple” which falls on Sunday. The foundation revealed in a press statement on Friday that the Israeli incursions into the Aqsa aim at strengthening the Jewish control over the Mosque in order to rebuild the alleged temple. Remember when the US sent over here a peace negotiator who had succeeded in Ireland? "From my experience there, I formed the conviction that there is no such thing as a conflict that can't be ended...Conflicts are created, conducted and sustained by human beings. They can be ended by human beings." Three of the four main dissident republican terror groups in Northern Ireland are to merge and reclaim the banner of the IRA, in an escalation of attempts to de-stabilise power sharing..the new organisation claimed it had formed a "unified structure, under a single leadership". It said the organisation would be "subservient to the constitution of the Irish Republican Army". This is the first time since the 1998 Good Friday Agreement that a majority of the forces of dissident republicanism has coalesced...the new paramilitary force included several hundred armed dissidents, including some former members of the now disbanded Provisional IRA...The new organisation is planning to intensify terror attacks on the security forces and other targets related to what it regards as symbols of the British presence, according to the source. Jaabari calls on Israel to end the occupation by imposing Israeli law on all parts of the land that it controls and naturalizing all its residents, as was accomplished by Israel's government in Jerusalem and the Golan through the Jerusalem Law in 1980. A Christian on Jabotinsky, anti-Zionism, etc. ...Talia Sasson...has criticized the Commission on the grounds that its conclusions are contradicted by Israeli Supreme Court rulings. But contrary to Sasson’s assertions, while the Supreme Court has adjudicated cases on the basis of Israel’s voluntary assumption of selected duties of a belligerent occupant, the Court has never ruled that the Fourth Geneva Convention applies de jure to the West Bank. Others have objected that the Levy report’s conclusions can be disputed by international jurists, including by a controversial and non-binding advisory opinion of the International Court of Justice...The Levy Commission’s conclusions are logical applications of reasonable understandings of the rules in an area where no authoritative resolution of the dispute has yet been rendered. 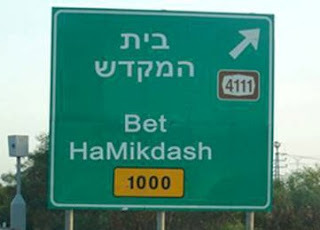 How Do You Spell 'Ben-Gurion'? Just Now He Read Jabotinsky? Does News Have to Be Logical? Who Is Anne Kennedy and Who The H___ Cares? Can I Have the Right To Demonstrate Too? Are Y O U Ready? Does APN Think There are "Guilty Israelis"?